In a sad commentary on the health of the Corinthian church, the apostle Paul declares that when the Corinthian church members gather together, “it is not for better, but for worse” (11:17). The weekly gatherings of the Corinthian church (16:2) were a fleshly display of what one author termed “radical individualism” rather than a sweet “manifestation of the Spirit for common good” (12:7). 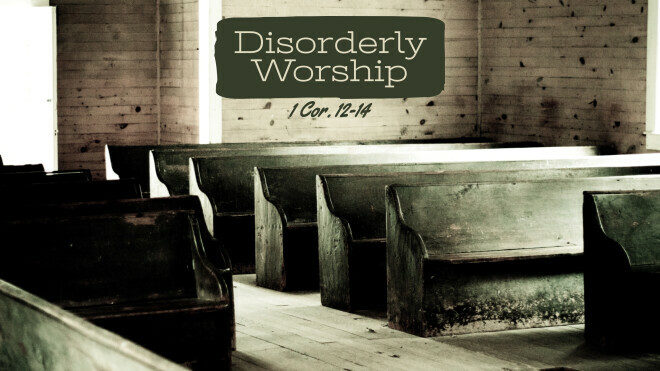 To correct this problem of disorderly worship, Paul develops his thoughts in 1 Corinthians 12-14 with six essential ideas. I will address the first two below. First (12:1-3), Paul begins (12:1) and ends (14:37) this correction with the truth that the brothers and sisters are “people of the Spirit.” In his letter, he has been emphatic that “those who love God” have “received the Spirit who is from God” (2:9-12), and their body is now “a temple of God’s Spirit” (6:19). This intimate relationship with the Spirit manifests a unique change so that they are no longer identified as “pagan people” following “gods that do not exist” (12:2 with 8:4), and they now boldly confess: “Jesus is Lord” (12:3). All the members of the church have been dramatically transformed by God’s Spirit, so that the weekly gathering should be a clear reflection of him, not them. Second (12:4-11), when the church comes together Paul believes that the Spirit of God will empower the members to minister to each other “for common good” (12:7). This “empowering” (12:11) demonstrates itself in the personal gifts, ministries, and activities of each believer. Paul is broadening the Corinthian’s understanding of “spiritual gifts” to include gifts and functions that the Spirit energizes to edify the body of believers (Garland). Paul offers nine notable illustrations of what these gifts and functions may look like. The sense one gets reading this letter is that these gifts and functions are not necessarily permanent deposits from the Spirit, but necessary “manifestations of the Spirit” through each individual to the gathered believers at a particular time. The “manifestation of the Spirit” Paul refers to in verse 7 has been viewed in two ways. On the one hand, some see the phrase “of the Spirit” as describing, “what the Spirit produces.” On the other hand, some prefer the phrase as describing, “the manifestation of the Spirit’s presence.” However, neither side is compelling (Garland). Paul seems purposely ambiguous so that both ideas are to be understood in this phrase: The gifts and functions are sourced in the Spirit, and these gifts/ministries/activities disclose his unmistakable presence among his gathered people. As you ponder these two essentials of Paul, I ask you to consider your own weekly worship-gathering, as I do, with these 3 questions: (1) Is the gathering at my church a clear reflection of God’s Spirit, or does it accent the performance of the leaders? (2) Am I ministering and serving in humility for the edification of the Body and glory of God, or am I only serving if others notice? Finally, (3) Do I sense the genuine presence of God’s Spirit when I gather with the Body, or does this even matter to me? I find that if I ask these questions (or something like them) before I attend the worship services of my fellowship, I become more conscious of God’s purpose for the gathering, and I respond with greater intentionality to my place within the gathering.